A discussion of the reality of myth, the art of Black Africa, India, China, and Japan, and growth processes in our changing world. Dorothea Johnson Blom (1911-1991) became a Quaker in 1937 at the age of 26. Her early work included designing batiks for a Madison Avenue clothing shop and writing nine books for Doubleday press on a variety of subjects. Her temperament led her away from writing and design in favor of more personal interactions of teaching and learning using a variety of forms of artistic expression. 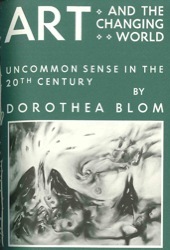 Dorothea Blom’s specialty in teaching was adult art education. She brought this talent to a number of Quaker adult educational institutions including Pendle Hill and Woodbrooke. While teaching at Woodbrooke, she also got an opportunity to lecture at the Tate Museum of Modern art in London. Her pamphlet, The Prophetic Element in Modern Art, contextualized modern art by reference to the social and spiritual prescience of significant figures in art history. Creeds and Quakers: What’s Belief Got To Do With It?